Arzachena (Gallurese: Alzachèna, Sardinian: Altzaghèna) is a town and comune in the province of Olbia-Tempio, northern Sardinia, Italy. Arzachena lies half way between the original Costa Smeralda resort and Porto Rafael, both founded in the late 1950s. 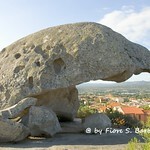 After Olbia and Tempio Pausania, it is the third largest commune in Gallura by inhabitants. The frazione of Porto Cervo is the main resort area of Costa Smeralda for summer tourism, which has replaced agriculture as the local main economical source starting from the 1960s. Nearby there are numerous archaeological sites from the Nuragic period, including those from a local sub-culture known as Arzachena culture (necropolis of Li Muri and others).